Karnali River is the longest and largest river in Nepal, which has its roots on Mount Kailash in Tibet. From there, it flows south to Nepal after gaining water glacier of Kanjiroba Himal, where the Karnali River drops off into harsh canyons. The rapid then chisel the Himalayan terrain into several gorges and canyons before proceeding to remote areas of serene woods. The lower section of Karnali River takes a sharp bend from south to north, called the Western Bend, at which point the river passes through deep gorges to a remote region. 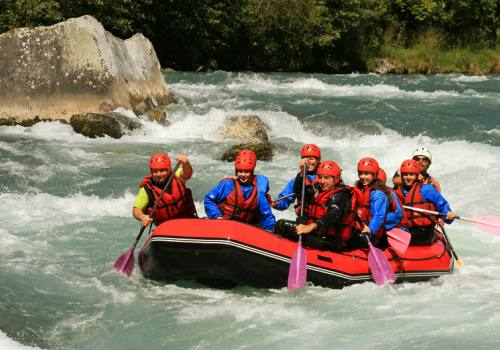 Engaging in Karnali River Rafting will take you through an adrenaline adventure which proceeds through steep and challenging white water and hidden wilderness. The notorious rapids in Karnali River are more constricted and steeper than most others in Nepal. 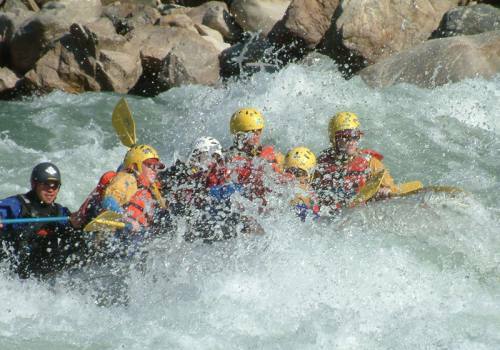 Karnali River Rafting commences by driving to Surkhet from where we will head towards Sauli Bazaar, the point of initiation of Karnali River Rafting. 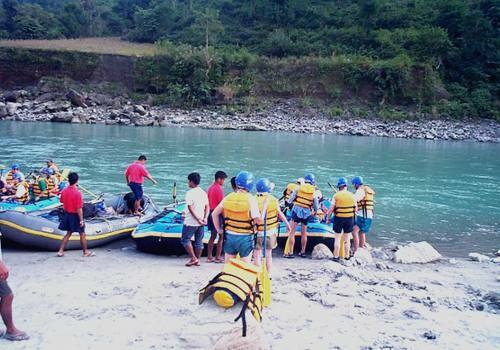 We will undergo series of rapids and bends to cover total 180km. There is an aura of serenity as we pass through raw landscapes before finally reaching Chisopani, the check out point for Karnali River Rafting. Enthralled in the life altering voyage, we drive back to Kathmandu to enjoy a final Farewell Dinner together before you leave the country. Day 02Drive from Kathmandu to SurkhetIt takes nearly 11 hours of driving to cover 377km and make it to Surkhet, the regional headquarter of Mid-Western Region of Nepal. Overnight in hotel. Day 03Drive from Surkhet to Sauli BazaarA drive of about 5hrs from Surkhet through pretty little villages and scenic views of hillocks will lead us to Sauli Bazaar. Overnight in hotel. Day 04All Day RaftingThe real rafting experience begins from Sauli Bazaar. We'll be experiencing some drops and rapids for the first day, getting a feel for how the water moves the raft. Overnight camp at the bank of Karnali River. 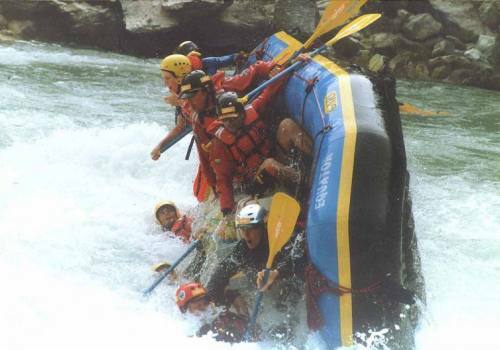 Day 05Rafting in Karnali RiverRafting on this day will be bit strenuous as we will be passing through the gorges and turbulent water. 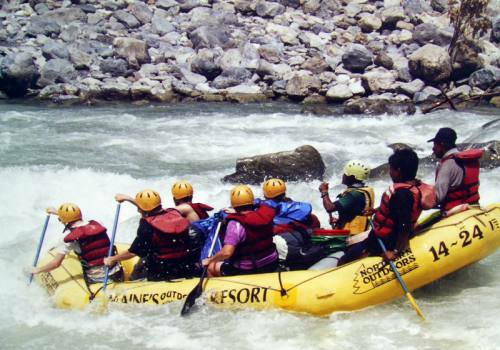 Day 06Rafting in Karnali River, Camp at Seti DovanAfter breakfast, we head for the rapids. The water guides us as we turn, drop, and get splashed all the way to Seti Dovan. Overnight in tented camp at Seti Dovan. Day 07Raft from Seti Dovan to Jamuna VillageToday is a relaxing day on the river. We float through picturesque landscapes and enchanting views of mountains. Overnight in tented camp at Jamuna Village. Day 08Rest DayToday is a highly anticipated exploration day. We take break from rafting and head out for a short hike around the woods of Jamuna Village. We get to interact with the locals and use our feet instead of our hands and arms. We head back for dinner at our camp. Overnight in tented camp at Jamuna Village. Day 09All Day RaftingAfter breakfast, we hop in the rafts, ready for today's float. You'll notice that the turbulent flow of the river has diminished to a great extent and the river is now calm and peaceful. 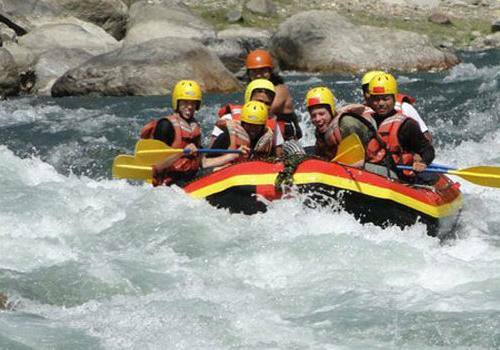 Passing through the confluence where the Karnali meets with the Seti River, we will continue our rafting. Overnight in tented camp on the side of the river. Day 10End Rafting at Chisopani Bridge, Drive back to KathmanduWe will conclude Karnali River Rafting at Chisopani Bridge and either drive back to Kathmandu. Farewell dinner in the evening and overnight at hotel. Day 11DepartureWe will transport you to the airport. Thanks for trekking with Adventure Himalayan Travels and Treks. We look forward to seeing you again!